The IJF has opened a new training centre in Lusaka, Zambia to mark a new chapter for judo in the South African country. The long-term project was fully financed by IJF who also fully supervised the construction of the new facility. 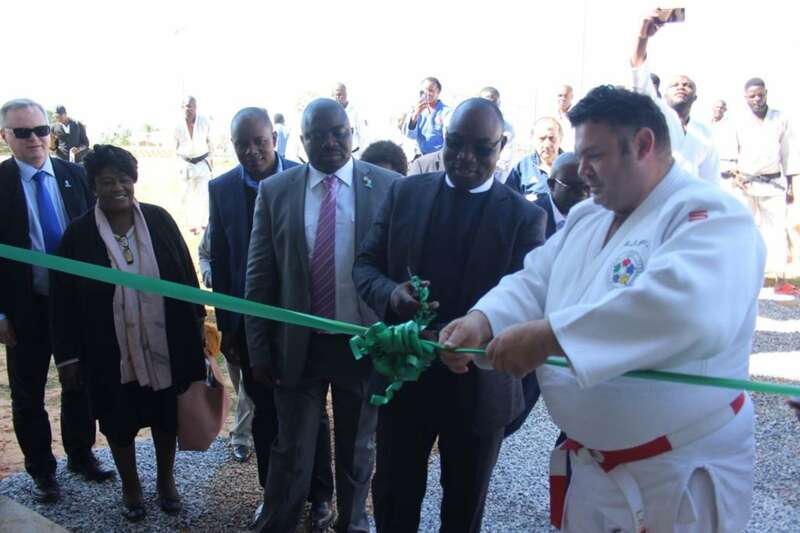 IJF President Marius L. Vizer made a pledge when he visited the previous training centre in 2010 to support the development and creation of a new state-of-the-art centre for Zambian judo. The new dojo was also supported financially by the Zambia Judo Association and the Ministry of Sport, Youth and Child Development through the Podium Performance Program. There is already a busy programme of events scheduled for the new facility which will offer first-class facilities to the Zambian national team and will also host educational activities to develop the society in the region and to attract more people to the sport. The training centre was officially opened by IJF Sports Director and former world champion Daniel Lascau who was part of an IJF delegation of experts who led an IJF Academy course to inaugurate the new venue. Moses Mawere, Ministy of Sport, Youth and Child Development, said: “It is indeed a great honour to stand before you to officially open the IJF Olympic Training Centre for Judo and at the same time to welcome the IJF Academy experts here for the third time. 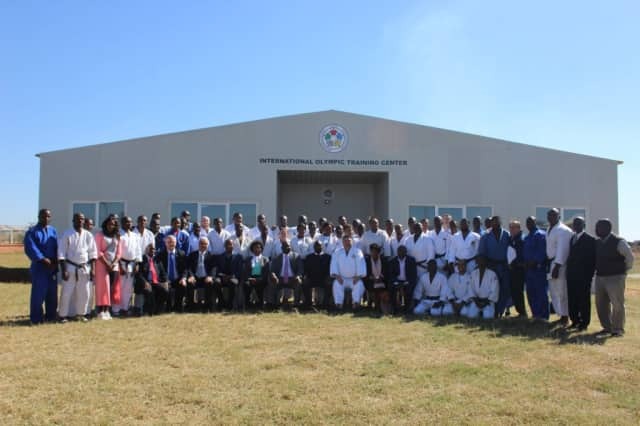 “I am reliably informed that this is the first ever Centre for the International Judo Federation on the Southern African region. Let me therefore take this opportunity to thank both the International Judo Federation President Mr Marius L. Vizer, the course facilitators and course participants for your resilience and uncompromised zeal and dedication in ensuring that the course objectives are achieved within the set time frame. Zambian National Olympic Committee President and Zambian Judo President Alfred Foloko said: “look around and am in awe with the collected expertise gathered here. What a rich CV ; we have IJF Director of Sport and Executive Member of the IJF Mr Daniel Lascau World Champion, The Academy Director Envic Galea, Dr Tibor Kozsla, Mr Comino Piero Kata Expert, Mr Huzinga Mark Olympic Champion, Ms Loretta Cusack-Doyle World Champion and our own son of the soil Mr Frank Mousima former Africa Champion. We are deeply honoured to welcome you. “Distinguished guests, our coming together this morning is in two spheres. Firstly, the honorable Minister is here to officially open the third session of the International Judo Federation Academy Practicals and secondly the Honorable Minister and the International Judo Federation will officially open our International Olympic Training Center for Judo. “Ladies and gentlemen, the course to be officially opened by the honorable Minister, is an Olympic solidarity supported course through our National Olympic Committee, the Zambia Judo Association and the International Judo Federation. This particular Course has explored a variety of topics, among them, history of judo, culture, nutrition and hydration, classification of judo, sport psychology, training methodology, coaching principals, refereeing first aid and neweza and tachiwaza among others. Zambia Judo and IJF are, therefore, committed in conducting in-service courses for capacity building for our coaches within the continent. This training is but the third among the many that shall be conducted in similar fashion in the near future. “In conclusion, I am delighted to inform you Guest of Honor, that amongst the 53 participants of this course 4 are presidents of national federations, one vice president and one General Secretary. I think they deserve our hearty congratulations. Of course this goes to show how African leadership is ready to embrace change in the manner we address our technical matters in sport and judo in particular. Stay tuned for an upcoming report on the latest IJF Academy session in Zambia.